If you're ever blind and lost on the tiny winding highways of central Oregon, watch for an unlikely town called Philomath, and an unlikely restaurant called Wing Sing. 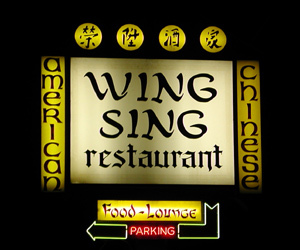 Wing Sing has both kinds of food, Chinese and American, and both kinds of music on the jukebox, Country and Western. My wife and I were exploring off the coast during our delightful stay in Waldport, and got mad lost on highway 34. I kept imagining it would "hook back" to the water. My wife knew I had taken us down the rabbit hole. I kept saying, "It's going to hook back right after this corner." And then there'd be another view of this pretty stream, more towering trees, denser fog, another pickup truck with a rifle, etc. Anyway, after about an hour of praying for a hook back, we roared into Philomath. Philomath looked to me, like heaven. It was a town with a highway that went west again. I saw a sign that said we were - impossibly - 100 miles from where we had started. I know we hadn't come that far, but I wasn't going back on Hwy. 34, it of the suddenly winding curves, the nervous and tiny shoulder. But before I committed to the larger Hwy. 20 and its unknown pleasures, I thought we should get something to eat. We looked up and down the main drag and saw only two lit signs, one that said "TAV RN," and one that said "Wing Sing's." You know, of course, that no place has a finer reputation for Chinese food than central Oregon, so that's where we went. 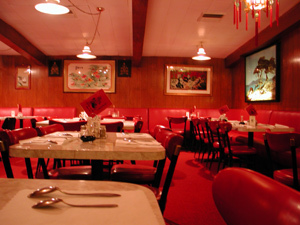 There are two rooms at Wing Sing, a bar attached to the north side of the building, and the restaurant to the south. a little walkway attaches the two rooms together. Over in the bar there were three people, a woman behind the bar, an old guy at a booth, and the old guy's daughter, Sherry, playing video poker while her dad waited for their food. It was Sherry's birthday. Our waitress told us. My wife and I sat in the restaurant alone and ordered chow mein and sweet and sour chicken. I was still fretting, still thinking about the hook back, wondering what kind of meat the chicken would be, but my wife was into the new adventure. We waited about 8 minutes and two gigantic plates arrived. The food smelled delicious and we dug in. Twenty minutes later we pushed back from the table, still the only one occupied. I gave my money to Darnelle, gave her an extra $5 to buy the birthday girl a drink, and we went back into the pitch blackness, aiming at Highway 20, delighted to see what and how it would get us back to from where we'd come.